Irrigation efficiency pays in Alta. Irrigation specialists say new pipes and pivots through efficiency programs are helping southern Alberta producers lower costs and conserve more water. One of the newer initiatives, called the Irrigation Efficiency Program, has already been showing results, said Brad Calder, a soil and water technologist with Alberta Agriculture’s irrigation section. Comparing 1981 to 2011, more has been done with less. The industry required 29 percent less breeding stock, 27 percent fewer cattle for slaughter and produced 15 percent less greenhouse gas emissions. In addition, 24 percent less land was required to produce the same amount of beef. For every kilogram of beef produced, 17 percent less water was required. SALTS would be delighted if you could join them for their 21st AGM on Tuesday, March 19 at 2:00 pm at the Highwood Golf & Country Club, 400 7th Street NW in High River. In addition to the usual formalities of an AGM, we would appreciate the opportunity to update you on some of our recent successes as well as some of the exciting projects we are working on in 2019. We would also appreciate hearing ideas that you may have on SALTS’ role/efforts in private land conservation that could help us going forward. RSVP by March 14th to Berry via email: berry@salts.land or phone 403-652-9998. The SEAWA watershed lies within semi-arid southern Alberta. In this desert-like region, the proper management of water is critical for healthy ecosystems, for economic success, and to meet human consumption needs. It is therefore important to consider and understand the management of water at all levels: individual, municipal, provincial, and federal. By carefully managing our water resources, and understanding supply forecasts, we can all contribute to ensuring the future availability and good quality of water within our watershed. It is also important for individuals to understand the laws and regulations around waterbodies, whether they be on private or public land, and the reasons behind them. With that in mind, SEAWA has invited speakers from the Government of Alberta, the University of Regina, the Bow River Basin Council, CE Analytic, and others, to give presentations at our educational forum. 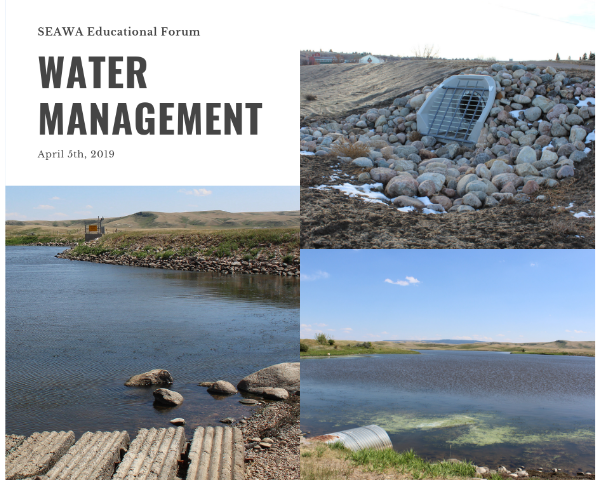 Presentations will include: water quality and quantity in southern Alberta, the effect of climate change on water supplies, the regional Water Quality Management Framework, Alberta's Water Act, how municipalities can conserve and protect wetlands, and other subjects. Refreshments and a light lunch will be provided. If you have any dietary restrictions please contact Brooklyn at brooklyn.neubeker@seawa.ca to arrange alternatives. Stay tuned for the final agenda and more details. We look forward to seeing you there! The Honourable Lois E. Mitchell, Lieutenant Governor of Alberta and Honorary Patron of Western Sky, will be in attendance to conduct the unveiling. This event is open to any and all who may wish to attend. A detailed invitation with driving instructions will be available in May. AGM & Featured Speakers Begin at 1:00 p.m.
An inexpensive and effective Swedish invention, known as a biobed, is likely an unfamiliar term for Canadian farmers. It is a below ground or above ground site where a sprayer is filled, tested and cleaned. The waste water from these processes is filtered into a biomix, which contains millions of microbial bodies that drive bioremediation, or the breaking down of pesticide waste. The biomix consists of three ingredients: straw, soil, and peat-free compost. “The key ingredient is straw, which forms a white mould that facilitates the microbial breakdown of pesticide waste,” Wolf said. He said the end result of the bioremediation process is pure soil and clean water, which could actually be used for subsequent spraying or washing. here are a few grants that are currently accepting applications. Environment and Climate Change Canada (ECCC) is accepting applications for funding until January 9, 2019 (deadline extended) for projects beginning in summer 2019. The application guide is attached. Preference will be given to proposals that engage Indigenous Peoples, youth or small businesses, and all proposals must fully meet the program requirements. Funding is available for new projects that engage Canadians and clearly demonstrate measurable, positive results related to fresh water. For more information, please visit the EcoAction Community Funding Program website or contact your Regional Office. Please note that you will need to register with EcoAction’s electronic platform, the Grants & Contributions Enterprise Management System (GCEMS), before submitting an application. The GCEMS is ECCC’s one-window platform for accessing their environmental funding programs. The Pathway to Canada Target 1 Challenge is part of Canada’s Nature Fund. Expressions of Interest (EOI), must be submitted by January 31, 2019 to ec.FDLNDefi-NFChallenge.ec@canada.ca. However, EOI’s are recommended by January 14, 2019, to confirm that your project fits with program priorities and to receive input from ECCC staff. After January 14, the complete Proposal Guide for applicants will be available through the GCEMS web portal. The deadline for detailed Formal Proposals is March 15, 2019. Please review the application instructions online for more information. Administered under the Canadian Agricultural Partnership (CAP) program, the Environmental Stewardship and Climate Change – Producer program supports producers in reducing negative impacts on the environment while enhancing sustainable production, managing climate change and increasing profitability in the agriculture sector. (Please note that a valid Alberta Environmental Farm Plan (EFP) is a prerequisite to this program.) The current application intake is open until January 23, 2019. You may also wish to explore the many other funding programs that CAP program offers. Each year the Alberta North American Waterfowl Management Plan (NAWMP) Partnership allocates funds, to a maximum of $30,000, in support of science projects that relate to the Alberta NAWMP Committee’s annual priorities. This year’s priorities will be announced shortly – please refer to the Alberta NAWMP webpage for details. Successful proposals will be awarded in April 2019. The Community Economic Development Corporation (CEDC) tax credit program will offer a 30 per cent tax credit to Albertans who invest in registered CEDCs. In turn, the corporations will provide capital to Alberta small businesses and co-operatives that focus on social improvement or rural economic development. A value-added agriculture business or tourism operator developing new products in a rural community. A business owner offering mentorship and training to employees to help them overcome employment barriers. A new owner carrying on the legacy of a community-based business when its original owners retire. A business offering affordable food products to lower-income families. Similar credits have been available in Manitoba and the Maritime provinces for several years. The program budget is $9 million over three years. Application intake for the program is now open. Additional program details, including eligibility criteria and information on when, where and how to apply, are available at alberta.ca/community-economic-development-corporation-tax-credit.aspx. Two thousand acres of prime real estate west of Turner Valley will be protected from development in a deal announced by the Nature Conservancy of Canada (NCC) on Thursday. The voluntary agreement with the owner of the White Moose Ranch will protect the 811-hectare portion of the property while allowing cattle operations to continue. "From the day our White Moose Ranch first acquired this breathtaking property in 1992, I knew that we needed to find a way to preserve it in its natural state," said owner Stan Carscallen in a news release. "We share a three-mile boundary on our south side with the OH Ranch. Over the years, I frequently spoke with our friend, Doc Seaman, about realizing a mutual dream of working together to create a single, contiguous block of conserved land extending from the Highwood River to the Sheep River that could never be developed or subdivided. This donation completes that dream, and my family and I are proud to be part of that accomplishment." The NCC said the protected portion of the ranch, which lies along the Sheep River, features a mix of fescue grasslands, montane forests and riparian areas. "It provides year-round habitat for elk, moose, mule deer, white-tailed deer, black bear, cougar, gray wolf, coyote and bald and golden eagles," said the organization in its news release. "Grizzly bears, which are listed under the Species at Risk Act as Special Concern, are often seen on White Moose Ranch." The NCC said mountain sheep, lynx, badgers, wolverines, red-tailed hawks and great horned owls have also been spotted on the property. The area is under increasing development pressure, according to the NCC, due to its scenery and proximity to Calgary. The fescue grassland habitat is also one of the most threatened ecosystems in the country, according to the organization, with less than five per cent estimated to be intact.